Then Jesus told [the Pharisee] this story: "A man loaned money to two people — 500 pieces of silver to one and 50 pieces to the other. But neither of them could repay him, so he kindly forgave them both, canceling their debts. Who do you suppose loved him more after that?" Simon answered, "I suppose the one for whom he canceled the larger debt." "That's right," Jesus said. 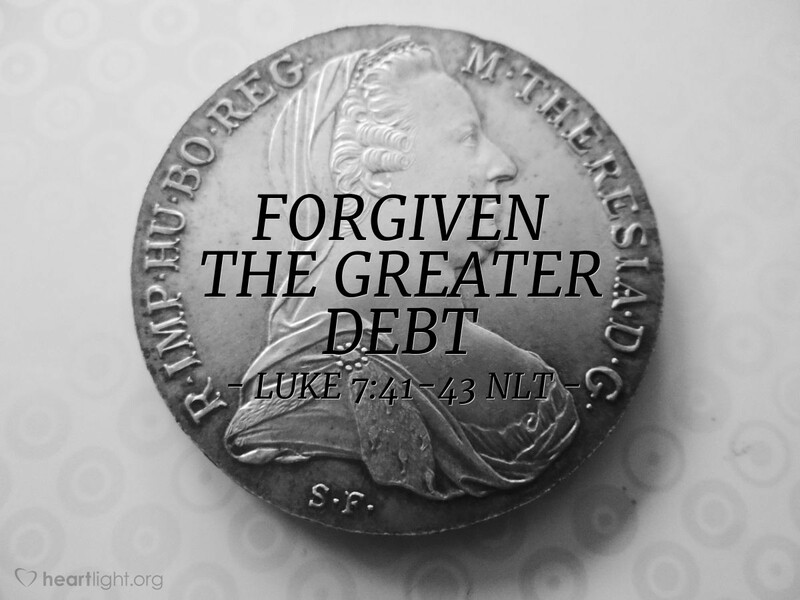 Have you been forgiven much? That's the whole issue with our Christian walk. Joy, appreciation, thanksgiving, and devoted service are the heartfelt responses to a deep realization that, in Jesus Christ, God has forgiven us of everything! We have been forgiven of more than "much;" we've been forgiven of everything! Holy and righteous God, thank you for sending Jesus to pay the price for my sin so that you could forgive me of everything. How can I ever express my appreciation appropriately? I know there is no equivalent that I can offer to you, dear Father, but I offer you my life, my love, my service, and my all in deepest appreciation. In Jesus' name. Amen.